The most critical area for improvement is in the attic and basement. A typical house has many penetrations throughout a structure like plumbing chase ways, chimneys, and other mechanical penetrations that start in the basement and lead up through the house. Air moves up through these spaces and you lose the air you are trying to condition. This effect, called The Stack Effect, leads to a number of common house hold problems and the solution is Air Sealing. Next on the priority list for improvements is Insulation. Once the air movement is stopped, it’s time to increase the insulation levels in the attic, walls, and basement. Home owners spend a significant amount of money conditioning the air in their home to make it comfortable and insulation will help to maintain that comfort level. The greater the insulation, the longer it takes for the heat to move through the walls. The third priority is upgrading the heating and cooling equipment with high efficient equipment and Duct Sealing. A simple change out of an old inefficient heating system could save you 20% on heating alone. We recommend that a furnace 10 years or older should be exchanged with a high efficiency unit. Replacing your heating and cooling equipment will be very cost effective and will give you greater comfort. Once we have established an efficient way of conditioning your air, we need to make sure we are distributing the air effectively. 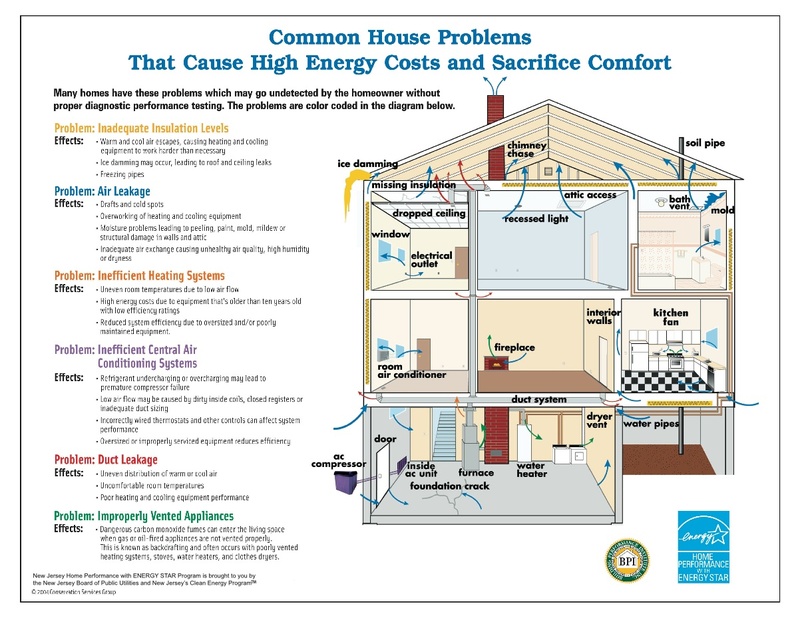 A leaky duct system will lead to wasted energy and high utility bills, but it will also lead to pressure, comfort, and health & safety problems inside the home. A common misconception is that windows and doors will attribute to significant heat savings. Windows and doors are actually considered low on the totem pole as far as energy efficiency is concerned. The reason is that your old windows have no insulation value whereas the replacement windows have a small value of insulation and doors are typically the same. Air sealing, insulation, and replacing your heating and cooling system to high efficiency are the major contributors to energy savings.